Thinking about putting a puppy or kitten beneath the Christmas tree this year? Allow us a moment to help you reconsider – and not just because a frightened dog could bite your brother’s new girlfriend and test your family’s homeowners insurance policy. Pets are a 10- to 20-year commitment, depending on the breed, and they require a lot of time and attention. So courtesy of Rocky’s Retreat, Florida’s only health and fitness center for dogs, here are 10 questions to ask yourself before you bring someone furry home for the holidays. 1. Have You Ever Owned a Pet? If you haven’t, Christmas probably isn’t the best time to get used to waking up at 5 a.m. to feed your new friend, take him or her outside for a bathroom break, and rush home from festivities later in the day to make sure your pup doesn’t pee on the carpet. Nor is it a good time to learn the best way to clean a new litter box – or to teach a kitten to use it. 2. Do You Live in an Apartment or a House? Pet-friendly apartments usually have breed and size restrictions, so check your lease before you bring home a pet and have to return it. Likewise, if you rent a house or a duplex, ask your landlord for permission before you add a four-legged tenant. If you live on an upper floor, remember that you’ll have to take a puppy outside several times a day. 3. Are You Only Getting a Pup to Please Your Kids? Not every breed meshes well with children, Rocky’s Retreat said. Little kids, who tend to be rough, can wind up getting bit. Also, children often become bored with dogs once they outgrow puppyhood or as children become bogged down with homework, sports, and chores. That means you’ll have to pick up their slack or break a lot of hearts by taking the pet to a shelter. 4. Do You Want a Little Dog or a Large One? Unless you want your life to turn into a “Clifford the Big Red Dog” story, make sure you research how big that breed you’re considering will get. And keep in mind that small breeds bark loudly. You may only hear it when someone approaches your home, but your neighbors will hear it for hours if your pet suffers from separation anxiety while you’re at work. 5. Is the Breed You’re Considering Hyper? Dogs need to go for walks. Some enjoy going for a run. And, newsflash, your children probably won’t be the ones taking the dog for a walk or a run – especially if it’s raining or snowing. So if you’re the type of person who binge watches TV, consider adopting an older dog, Rocky’s Retreat said. 7. Do You Work Long Hours? Puppies have a tiny bladder, so you’ll have to hire a dog walker to take your pet outside every couple of hours while you work and commute. 8. Are You a Clean Freak? Dogs and cats shed a lot, and cats cough up hairballs, so if you have white, black, or expensive furniture, a pet may trigger anxiety attacks. 9. Can You Afford a Pet? Pets swell up from bee stings, swallow things they shouldn’t, and need shots. They also come down with illnesses and diseases just like people. Make sure you can pay for veterinary bills or get pet insurance before you adopt an animal. 10. Do You Have the Time, Energy, and Patience to Train a Pet? If raising your children has been exhausting, think about how hard it will be to train a pet that doesn’t speak your language. 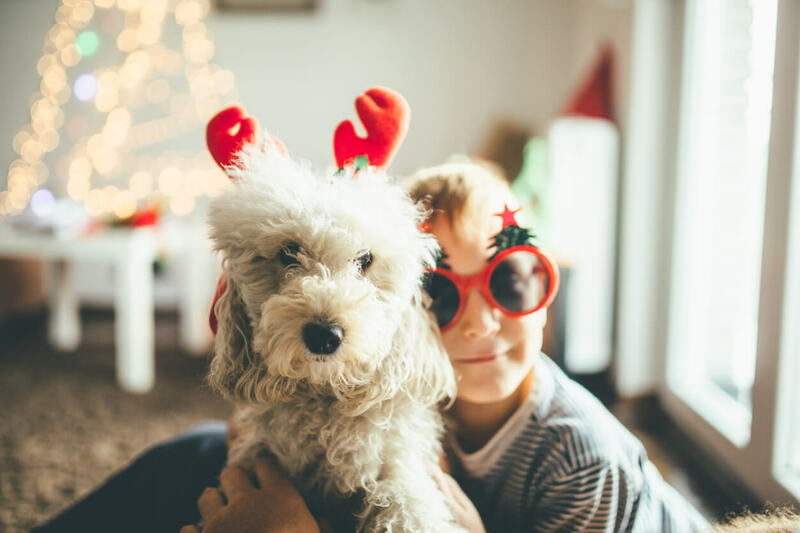 Instead of adopting an animal during an already hectic time of year, consider taking your children to your local animal shelter and donating money, food, or supplies, petMD said. Still Thinking About Giving Your Children a Pet for Christmas? If the questions and tips above haven’t convinced you to adopt a pet at another time, you may want to compare homeowners insurance rates with Freeway – just in case. As petMD said, Christmas is chaotic with all of the shiny decorations and people coming and going. Scared pets may soil floors, hide in hard-to-reach places, or bite.